So I grew some Carolina Reaper Peppers last summer and dried them. I’m still discovering new uses for them and this recipe has a hidden burn that really takes you by surprise after you’re halfway through your meal. In these proportions it won’t kill you, but you can always add more reaper if that’s your thing (or less). You do you. If you’re wondering where to get these well… I guess you could get them here. Reconstitute dried peppers with 3/4 cup boiling water for at least 20 minutes. Blend peppers and water in a blender with a can of adobe chipotle peppers in their sauce and a can of tomatoes. Blend until smooth. Remove the skin from the chicken. Heat 1 tbsp oil and brown the chicken over high heat in a non-stick skillet in batches until it is all browned. You can also do this step on a grill outside if you’re up for an adventure. The grill method adds some nice flavor to the end product. Remove the chicken once brown and set aside. Add 1 tbsp canola oil to a dutch oven, cast iron or stainless until shimmery and hot. Fry the whole cumin seeds for 20-30 seconds and then add the onions and black pepper. Fry over medium-high heat for approx. 3 minutes. Add garlic and fry for an additional one minute or until amazingly fragrant. Add chicken, with all accumulated juices to the aromatics along with enough contents of the blender to just cover the chicken. Stir to combine. Simmer for 20 minutes with a lid and 20 minutes without a lid to evaporate some of the liquid. Use your judgement here, if it looks like it’s getting dry add some water, stock, or diablo sauce if you have extra. Start checking the shredability of the chicken pieces by giving them a good poke after an hour and a half. 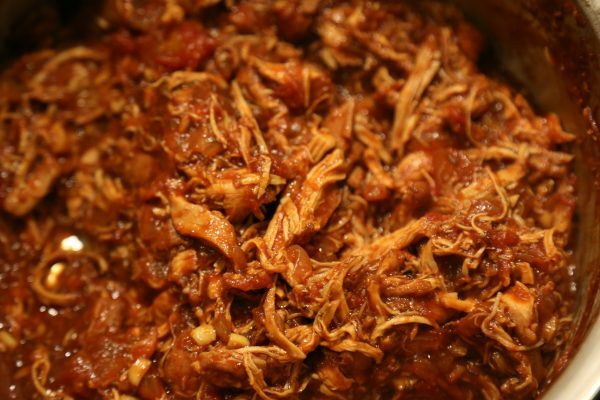 Shred it once it pulls apart easily or serve the pieces whole smothered in the sauce. If you have to much sauce at this point you can put some aside as well until your perfect proportions are present. Salt to taste. Serve as tacos, enchilada filling, in a quesadilla, on a taco salad, you get the idea. You can save the unused portion of the sauce to top the chicken or save to add to soups and pastas or anything else that could use a splash of diablo. I ended up frying some Mexican cheese and making cheese diablo tacos on corn tortillas but that adventure is for another day. 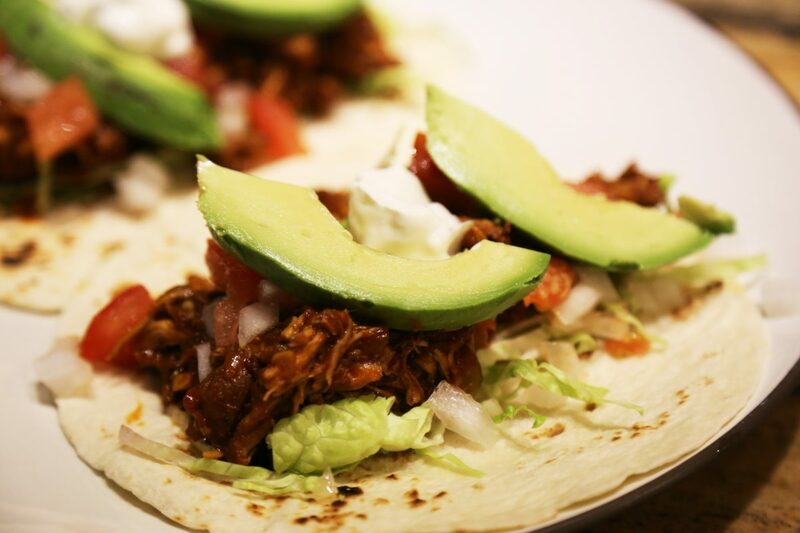 I served this recipe as tacos on this occasion with the avocado and sour cream playing counterpoint to the heat in the chicken. 15 Small Dried Chilis (Buquinio or Arbol) Substitute 5 tbsp of Smoked Mango Habanero sauce if you like here.